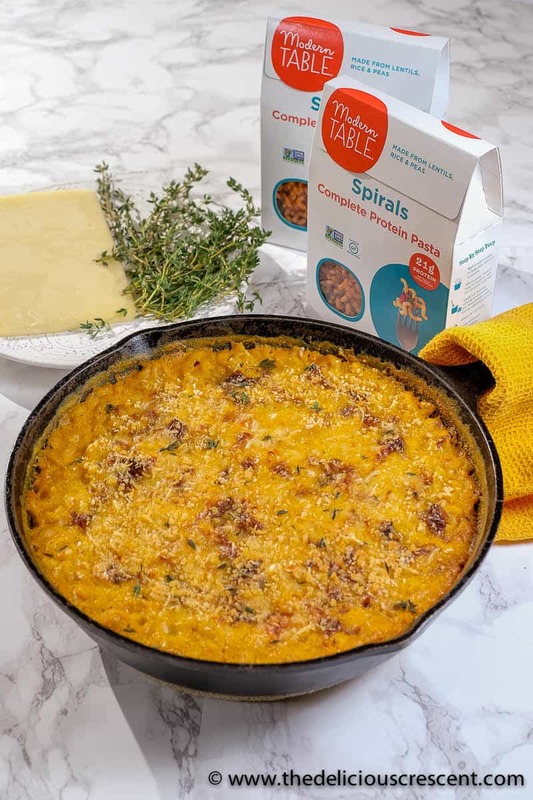 This healthy mac and cheese, is made with delicious lentil pasta and tastes so rich, creamy and cheesy. An ultimate comfort food that will please both kids and adults. You will not even know how cleverly this incredibly rich tasting recipe sneaks in vegetables, while taking the flavor and nutrition up a notch! Mac and cheese is a classic comfort food that is an evergreen favorite especially with kids. But most popular recipes are prepared with lots of butter, cheese, refined flour and refined flour pasta. So naturally they come with a big dose of calories, total fat and saturated fat. The recipe here is a significant improvement over traditional mac and cheese recipes, but with ‘no change’ to the taste. A brilliant way to maintain the creamy and rich taste is to use butternut squash, while lowering the amount of cheese and boosting the nutrition. The bonus is it gives that characteristic mac & cheese color to the sauce without so much cheese. 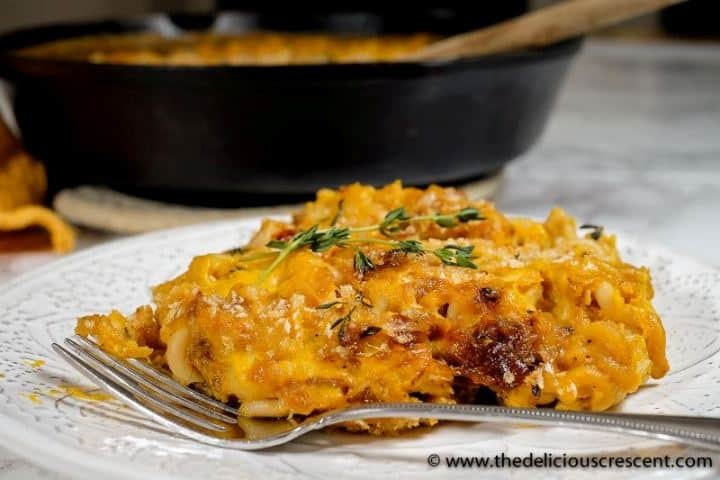 And this healthy mac and cheese recipe also uses caramelized onions that adds the irresistible “French Onion” flavor along with fragrant thyme and bay leaves. It is so good that even Adults will enjoy it as much as kids. Promise! So you have one healthy meal for the whole family. Just the right thing to have during these cold stormy winters! Step 1: Caramelize onions with butter, olive oil, grated garlic, thyme, bay leaves, pinch of salt and pepper. More detailed steps for caramelizing onions here. I use the 7.5 mm setting on my mandolin slicer. Step 2: Cook butternut squash in boiling salted water until tender. Step 3: Cook the Modern Table Spirals complete protein pasta in boiling salted water and drain 2 minutes prior to al dente stage (as it will cook more while baking later). Toss it with some olive oil, spread it on a plate and cool it completely. Step 4 & 5: Add milk and salt to the butternut squash and puree it to a smooth paste in a high speed blender. Heat the butternut squash-milk mixture and add half the caramelized onions. Stir the cheese into the sauce as it melts. Add the cooled pasta and seasonings to the sauce and stir. Top with remaining caramelized onions, shredded cheese, optional gluten-free breadcrumbs and Parmesan cheese if you like. Bake at 375 degrees F for 15 to 20 minutes, until golden brown on the top. 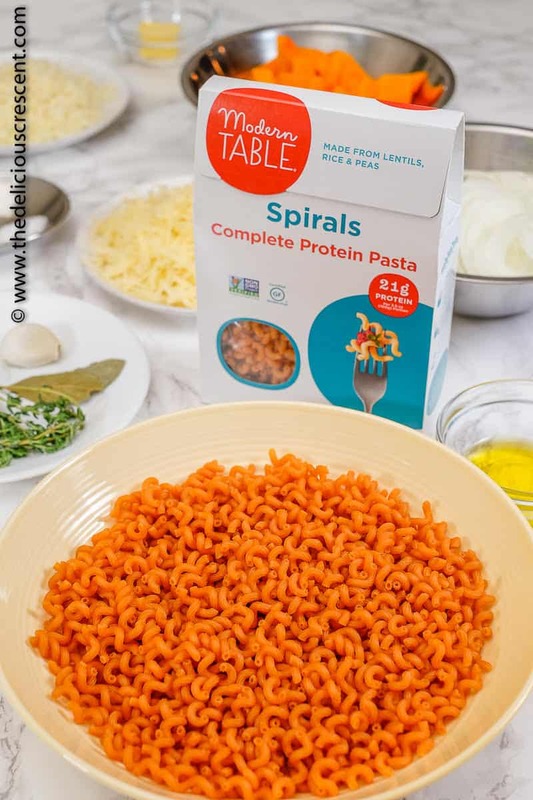 The star of the show really is the “Red lentil Pasta” from Modern Table. It is a gluten-free pasta made from red lentils, white rice, pea protein and is packed with plant protein and fiber. Red lentils also provide phytochemicals with antioxidant properties. This pasta has the same irresistible texture of traditional wheat pasta, but feels much lighter and still makes an absolutely filling and satisfying meal. One 3.5 oz portion of dry pasta contains 21 g of protein and 6 g of fiber. 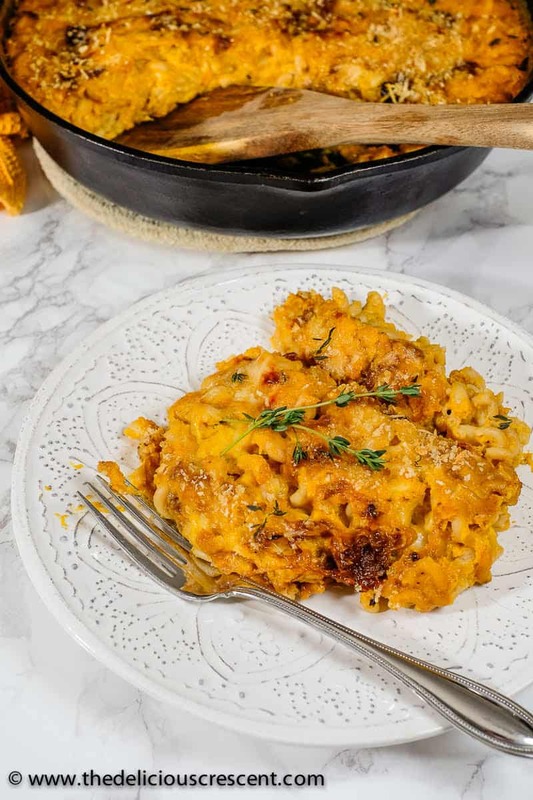 So the plant protein and fiber along with the fat content in this healthy mac and cheese is a perfect mix of satiating nutrients that will keep you fueled in a healthy way. Not to mention the big bonus from the additional nutrients from the lentil pasta. 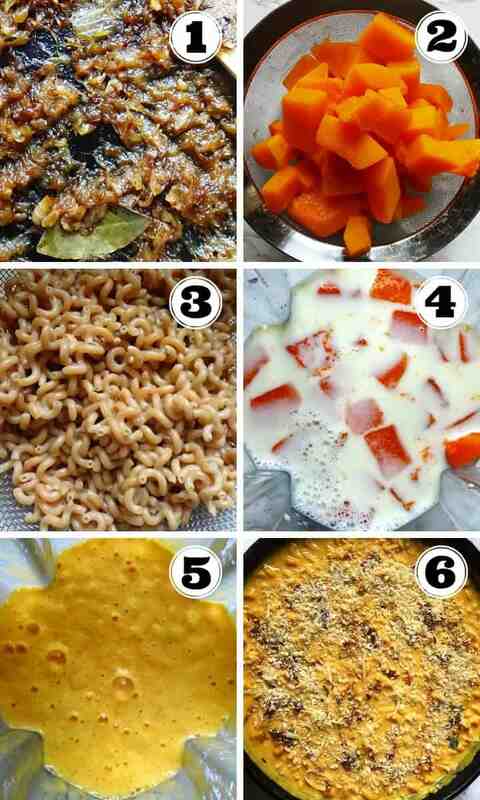 I have used red lentil pasta ever since it had come out in the market. But I can say that the Modern Table lentil pasta texture is delightfully better than the brand I had used before. All pastas are lentil-based and contain complete proteins – meaning they have the 9 essential amino acids our bodies need for strong energy, good digestion, and muscle health. Add vegetables as purees to the sauce – butternut squash, carrots and cauliflower. Note that the cauliflower flavor will be a bit noticeable. Add vegetables just before end of cooking time – peas, broccoli. Try roasted vegetables (zucchini, Brussels sprouts) or sautéed onions. Substitute some of the cheese with Greek yogurt. And use Parmesan cheese as a topping to boost the cheesy flavor. Try chickpea flour or amaranth flour for making the sauce instead of all purpose flour. Use gluten-free, high protein, high fiber pasta (such as this lentil pasta) instead of the commonly used refined flour pasta. Reduce the amount of butter. May substitute some or all of the milk with nut milks and chicken broth. Use grass fed dairy as it provides more omega-3 fats. Top it with almond slices instead of breadcrumbs and cheese. It is best to grate your own cheese. Ready made shredded cheese do not melt very well due to the additives. Under cook the pasta, toss with oil, spread it on a plate and let it cool. This will prevent the pasta from clumping together and becoming too soft or overcooked while baking. I like using Gruyere cheese as it goes so well with the French onion flavor. But you could also use cheddar, provolone, Gouda, jack cheese, pepper jack, Jalsberg Swiss, or a combination. Sharp or extra sharp cheddar has more intense flavor. And I use some mozzarella for that stringy texture. You can bake this in a large baking dish or in individual small bowls. Make Ahead: Prepare all the individual components – caramelized onions, pasta, sauce, topping etc and set it aside. Assemble and bake just before serving. Leftovers: The leftovers stay remarkably well in the refrigerator. I prefer to reheat in the oven. However you could also use a microwave, making sure to broil the top after that. Try this insanely delicious and healthy mac and cheese without sacrificing the taste. You don’t have to give up the good stuff, because the stuff you want is good. Now you can have your pasta and eat it too! 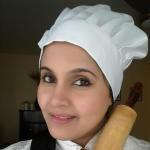 FOLLOW ME on PINTEREST, FACEBOOK, INSTAGRAM, YOUTUBE and TWITTER to see more of my recipes. Melt the butter in a 10 inch cast iron skillet. Add 1/2 tbsp olive oil and heat it. Next, add the sliced onions, 3 sprigs thyme, bay leaves, grated garlic, pinch of salt and pepper and stir. Sauté for about 20 minutes until nicely caramelized, checking and stirring in between. Once it is done, transfer the onions to a separate plate and set aside. While the onions are caramelizing, bring 4 quarts of salted water to a rolling boil. Add the chopped butternut squash and cook for 5 to 6 minutes until tender. Using a slotted wide spoon transfer the cooked butternut squash to a high speed blender and set aside. In the same boiling water add the lentil pasta and let it cook for about 3 to 4 minutes (2 minutes less than al dente stage, as it will cook while baking later). Drain the pasta and transfer to a bowl and toss it with some olive oil to coat the pasta. Spread the pasta over a plate to let it cool completely. This will prevent clumping. Add milk and 1/2 tsp salt to the butternut squash in a high speed blender and puree it to a smooth paste. If you dip a spatula into the mixture and run a finger over, it should leave the impression. 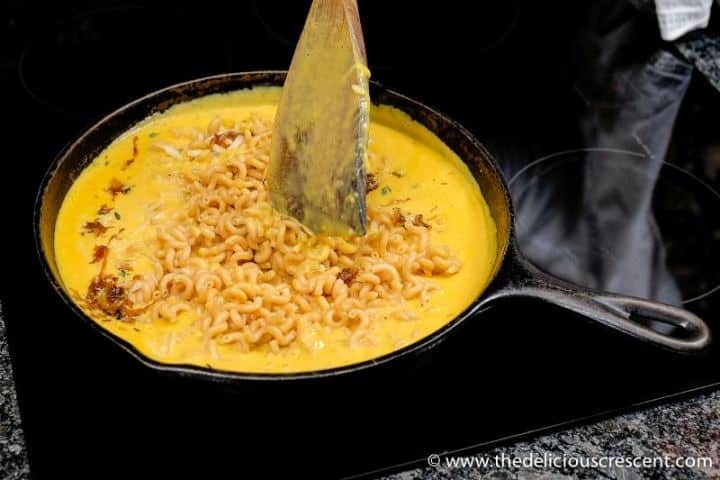 Pour the butternut squash and milk mixture into the cast iron skillet and heat it at medium setting for about 5 minutes. Stir half the caramelized onions into the sauce. Adjust the salt to taste. Move the skillet away from the stove, add the cheese to the sauce, reserving a little for topping in the end. Stir the cheese into the sauce as it melts. Then add the cooled pasta and any optional seasonings to the sauce and stir. Add dollops of the remaining caramelized onions on the top and tuck it in lightly using a fork. Top with the remaining shredded cheese. And then with gluten-free breadcrumbs and Parmesan cheese if you prefer. Place the skillet, uncovered in the oven and bake it for 15 to 20 minutes, until golden brown on the top (or just broil it a couple minutes more if the top doesn't turn golden). Serve it hot and fresh from the oven. Scatter a few thyme leaves on the top if you prefer. Alternatively you can just broil the top for a few minutes until it is golden brown on the top and skip the baking. You may want to cook the sauce a bit thicker before adding to the pasta as well. Oh I need to try Modern Table! This will be perfect for busy weeknights! Yes definitely give it a try. Loved the noodles. Love this healthier twist using butternut squash and those protein noodles. Sounds delicious and like pure comfort food. This must taste amazing! I love the French onion twist and I’m absilutely going to try it! This mac and cheese is the best! My whole family loved it and they are already requesting it again! Wow, so happy you like it :) Thanks Jessica. healthy mac and cheese? bring it on! Wow this is sheer brillance and I cant wait to try it!